Dato’ Rohana Tan Sri Mahmood is the Founder and Chairman of RM Capital Partners (RMCP), a Malaysian private equity fund which is a spin off from the successful Ethos Capital, which she co-founded in 2007. She is also the Founding Member of the Kuala Lumpur Business Club. 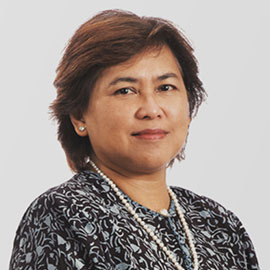 Dato’ Rohana sits as a Board Member of various public listed companies, including Am Investment Bank and Paramount Corporation, as well as private companies such as Sime Darby Industrial Holdings and YIM Technology Resources. She is a Board Member of the Pacific Basin Economic Council and the Institute of Strategic and International Studies (ISIS) Malaysia, besides being a Member of the Malaysian Committee of the Council for Security Cooperation in the Asia Pacific (CSCAP). Prior to this, Dato’ Rohana was attached to the Ministry of Foreign Affairs Malaysia. Dato’ Rohana has a BA (Hons) in Politics, Essex University, and Masters in International Relations, Sussex University, UK.